“I am trying to find a natural substance that will thicken hot milk so that the drink would be rich and creamy. Any clues? I have just the thing! I suggest you go to a Middle Eastern/Turkish grocery store and ask for sahlep/sahlap powder. It will make the famous Turkish national drink, also known as sahlep. Sahlep is a delicious creamy milk drink made with the powdered root of the sahlep mountain orchid, Orchis mascula (some say Orchis latifolia). Usually the mountain orchids have tuberous roots, rich in a starch-like substance. These tubers are gathered while the plant is in flower, then washed, boiled in water or milk and then dried, and ground. This ground powder is called sahlep. 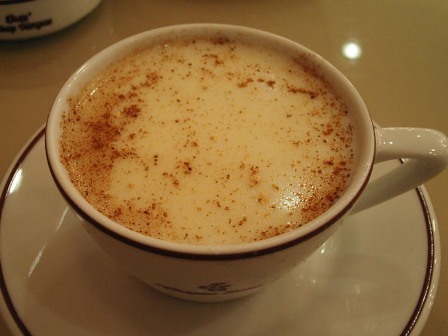 Sahlep, the drink, is served in several Middle Eastern countries, but it is especially popular in Turkey, where, in the cold winter months, it is sold from large copper urns on street corners, at stations and cafes. Sahlep powder is available from Turkish or Middle Eastern grocery stores. Combine the sugar and sahlep powder in a 2-litre/quart saucepan. Gradually add the cold milk, mixing to dissolve the sugar and sahlep. Bring the milk to the boil over moderate heat, stirring constantly to avoid scorching. Reduce to a simmer and cook for 1 or 2 minutes, or until it thickens slightly. Pour the sahlep into 4 individual cups, sprinkle each with a sprinkle of cinnamon powder, and serve hot.